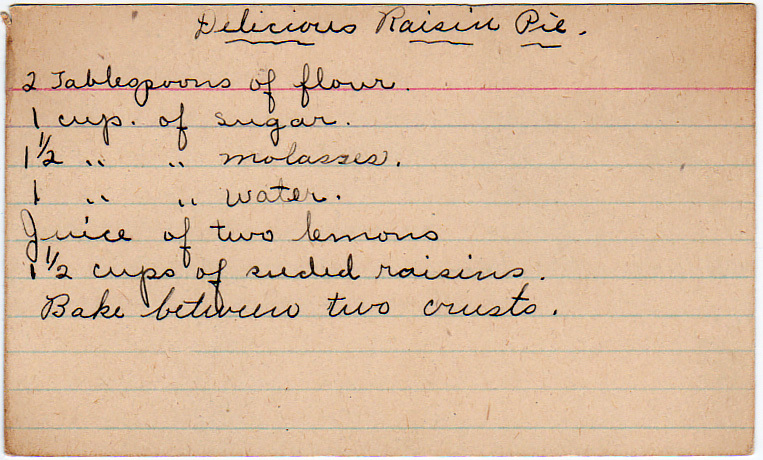 Raisins, molasses, and lemon juice. 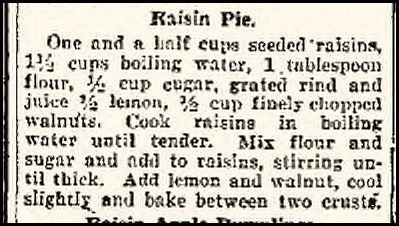 One and a half cups seeded raisins, 1-1/2 cups boiling water, 1 tablespoon flour, 1/2 cup sugar, grated rind and juice 1/2 lemon, 1/2 cup finely chopped walnuts. Cook raisins in boiling water until tender. Mix flour and sugar and add to raisins, stirring until thick. Add lemon and walnut, cool slightly and bake between two crusts. In my mother’s trunk I found a small pamphlet entitled ” Keep Fit eat ( in red) Magic Yeast (in black).” With a girl playing tennis. On the inside it tell of all the benefits of eating yeast. Such as, treatment of boils,pimples, constipation, stomach and bowel disorders, auto intoxication, gas and acid stomach. It looks old but is in great shape. It is about 2 inches long and 1 inche high.